Last week, we announced the arrival of Linking and Redirection to Confluence Cloud. Today, the spotlight is on Visibility - another popular app by ServiceRocket. With over 3,000 installations on Confluence Server, we are super excited to bring this app to Confluence Cloud users. Visibility allows you to dynamically show or hide content sections, based on various conditions. Many of our users use the app to create knowledge base, project documentation, release notes, user guides and dashboards in Confluence. No more creating separate page copies to cater for various audience. With Visibility, you can create sections that appear or become hidden depending on the current viewer or the current context of the page. Each user views content and section that is only relevant to them - all managed by Visibility. Remove confusion, reduce effort to find information and improve content effectiveness. Managing space permissions and page restrictions can be overkill for a simple content targeting. 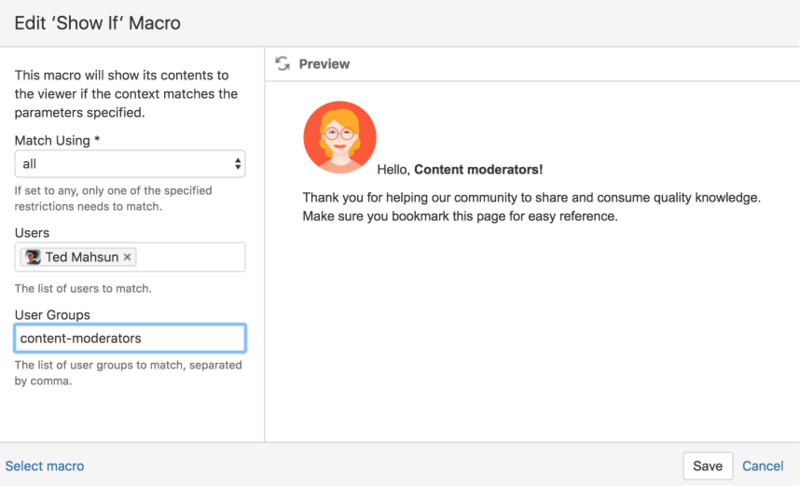 The Visibility macros are easy to use, so you can save time from configuring and spend more time on creating content. A free trial is available from the Atlassian Marketplace. Pricing for Visibility starts at $5 - and it comes with full support by our 24/5 support team. Looking for other apps? We’ve got a range of Cloud apps coming to Cloud: Composition Scaffolding, Reporting and more. Let us know what you need at https://servicerocket.typeform.com/to/ROAklf.